R VILALLONGA, PhD, A NADA, PhD, OSCAR GONZALEZ, PhD, A SÜMER, T DEMIREL, MANUEL ARMENGOL, U BARBAROS. General Surgery Department. Universitary Hospital Vall d’Hebron. Barcelona. Spain. General Surgery Department. Cairo University. Egypt.General Surgery Department, Istanbul University, Istanbul Faculty of Medicine. Turkey. INTRODUCTION: Since early nineties, laparoscopic appendectomy (LA) has become another optional treatment for acute appendicitis. A novel approach such as Single Port Access appendectomy (SPAA) has been described since then. In order to elucidate the possible differences between standard treatment and this novel technique, we designed a randomized comparative study. METHODS: Between July 2009 and March 2010, 87 patients were random for suspected appendicitis in order to perform SPA appendectomy or laparoscopic appendectomy. All patients were enrolled in this multicentre study. Three surgeons enrolled patients and were randomized in two different groups. In one group were enrolled patients who underwent standard laparsocopic approach and another group patients with SPAA. Standard trocars and instruments were used in both groups according to surgeon’s experience. Laparoscopy was performed and the appendix was removed. The ligation of appendix was performed either by thread loop, or endoscopic stapler. Outcomes, including blood loss, operative time, complications, and length of stay were recorded. Pain scores were analysed and time for discharge. The details regarding the recovery of patients were collected prospectively. RESULTS: There were 46 patients in the SPAA group and 41 in the LAG. The mean age of the patients was 34,2 (17-73) for the SPAA group and 37,7 (19-69)) for the LAG. There were 19 males and 27 females in the SPAA group and 22 males and 19 females in the LA group. SILSTM Port was used in 38 patients and TriPortTM in 8 patients. The mean operative time was 40,4 minutes in the SPAA group, and 35,0 minutes in the LA group. Only 1 patient of the SPAA group, the procedure was converted to an open approach due to technical difficulties in a colonic cancer. Complications occurred in 3 patients; 1 acute hearth infraction, an acute pulmonary oedema and finally a postoperative haemorrhage (all in the SPAA group). Surgeons used LigaSure® in 30 patients in the SPAA group and in 25 patients in the LA group. For the appendix section, endoloop were used in 22 patients in the SPPA group and in 33 patients in the LA group. Oral intake was accomplished after 12,5 hours in the SPAA group and 10,7 hours in the LA group. The mean hospital stay was 33,5 hours in the SPAA group and 34,0 hours in the LA group. Pain was evaluated and was 2,8 in the SPAA group and 2,9 in the LA group, according to the AVS after 24 hours. The degree of satisfaction was higher in the SPAA group (7,5 versus 6,9). Same results were found for the aesthetic result (8,6 versus 7,4). 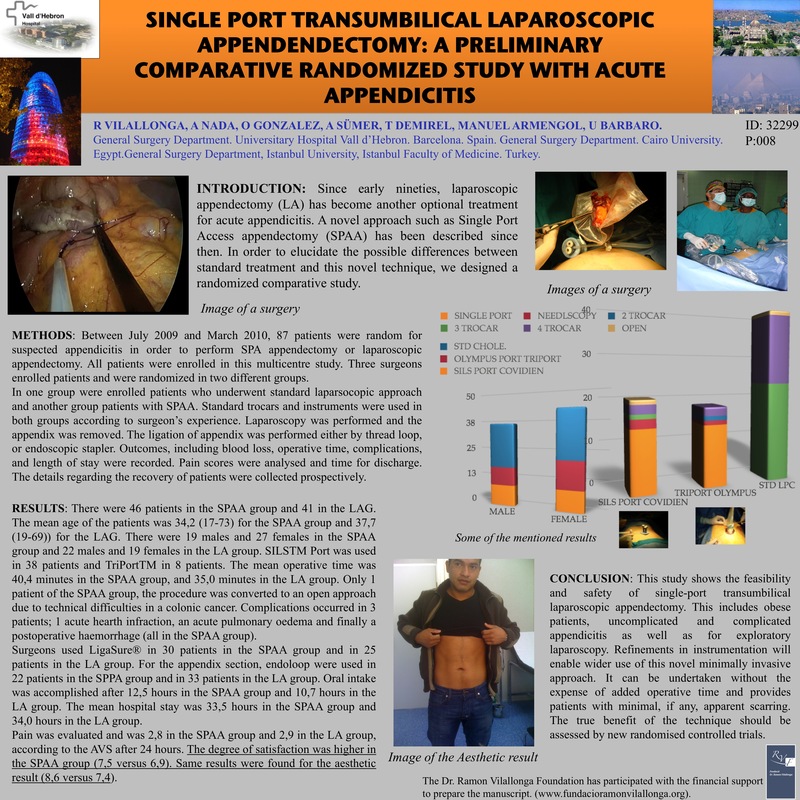 CONCLUSION: This study shows the feasibility and safety of single-port transumbilical laparoscopic appendectomy. This includes obese patients, uncomplicated and complicated appendicitis as well as for exploratory laparoscopy. Refinements in instrumentation will enable wider use of this novel minimally invasive approach. It can be undertaken without the expense of added operative time and provides patients with minimal, if any, apparent scarring. The true benefit of the technique should be assessed by new randomised controlled trials.